Welcome to Beat Black. This website was created to display all the handmade gothic, kawaii, curiously odd, kitschy, rockabilly, punk and just plain WTF pieces Beat Black has to offer, all in one place. All of the jewelry on here has been handmade (without molds) using a quality polymer clay from my place in downtown Toronto, Canada. The﻿ shop on this website is closed﻿ but you can still see a collection of the sold items on etsy or browse the gallery for more of Beat Blacks pieces from 2008-2013. You can also view some of the customer photos, fan art and craft shows that were posted over the years. Beat Black is now Crimeberry. 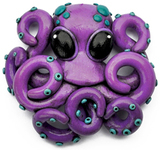 This new business picks up where the former polymer clay shop left off. 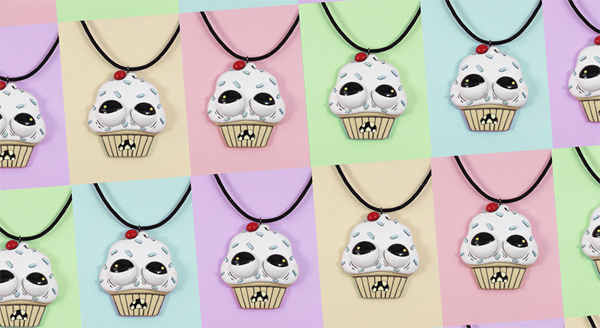 The "ugly cupcake necklace" from the movie SPY (2015) is now available for pre-order! !